the natural disaster of hurricane Harvey. In Australia most of the focus was on the rising AUD, while employment data showed an increase of 27.9k. The month also ended on a strong note with total construction work up 9.3% QoQ. The Bloomberg AusBond Composite Index for all maturities (the common benchmark) produced a small negative return of 0.01%. The Treasury Index for all maturities which is the single largest contributor to the Composite Index produced a negative 0.06% return. Credit was able to produce a positive 0.18% return. Credit provided the best returns. Credit Indices (corporate bonds) outperformed the Treasury Index (Government Bonds). The Credit Indices 7 -10 year bonds were at the top of the table with a 0.30% return. 0-3 year Government Bonds had a small positive return of 0.01%. 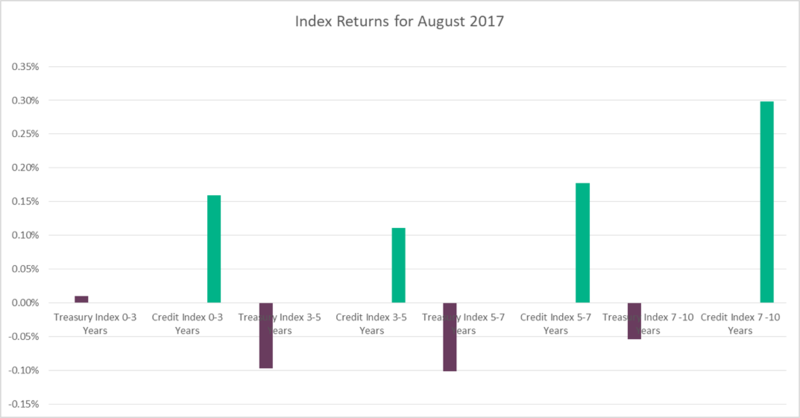 Year to date the indices have produced positive returns (Composite Index 2.50% and Credit index 3.58%). This is despite the fact that outside of Australia some central banks have been moving away from a monetary accommodative stance.